Continuing its 170-year history of offering the Best, the Only and the Unexpected, Hammacher Schlemmer introduces The Only Responsive Smart Bed, a bed that uses sleep technology to help alleviate back pain and other aches by monitoring your sleeping position and automatically responding with your desired amount of support. 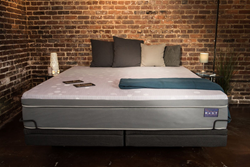 Paired with an app available for smartphone or tablet, the unique bed monitors nearly 2,000 pressure points across the body and adjusts overnight to provide each sleeper’s preferred level of firmness in five zones under the head, shoulders, lumbar, hips, and legs. Three operating modes lock in these settings in advance or continuously adjust depending on your position. All mechanical components are imperceptible beneath layers of dense memory foam, and the medical-grade, leak-resistant air chambers inflate and deflate quietly to not interrupt shuteye. The Only Responsive Smart Bed is available from Hammacher Schlemmer for $4,600 for King, $4,000 for Queen and $2,800 for Twin XL. For more information about The Only Responsive Smart Bed, please contact Trish Hammond at (847) 581-8987 or via e-mail at pr@hammacher.com.